Coprinus truncorum (Scop.) Fr., epicrisis: 248. 1838. Sel. icon. - Bender & Enderle, Z. Mykol. 54, opposite 64. 1988. Sel. descr. & figs. - Bender & Enderle, loc. cit. : 64. 1988; P.D. Orton & Watl., Br. Fung. Fl. 2: 55, fig. 101. 1979. Vern. name - Gladstelige glimmerinktzwam. Pileus up to 35 x 30 mm when still closed, subglobose, ovoid or ellipsoid, expanding to conical or convex and then up to 50 mm wide, at first ochre (Mu. 7.5 YR 4/6-5/8; Meth. 6D6), soon pale ochre (Mu. 10 YR 5/6, 6/6, 7/6; Meth. 4A3-4) with ochre centre, covered with minute, granular, whitish flocks but at least somewhat coloured at centre, soon dissapearing. Lamellae, L = c. 55-60, l = 3-5, free, first white then grey-brown to black, 3-8 mm broad. Stipe 40-140 x 2-7 mm, white, smooth or very fine fibrillous, base clavate with a volva-like margin. Spores 6.7-9.3 x 4.7-6.4(-7) x 4.2-5.6 µm, QB = 1.25-1.60, av. QB = 1.40-1.55, QW = 1.55-1.75, av. QW = 1.55-1.70, av. L = 7.8-8.3 µm, av. B = 5.0-5.8 µm, av. W = 4.6-5.1 µm, ellipsoid or ovoid, with rounded base and apex, in part slightly truncate, medium red-brown; germ pore central, 1.0-1.3 µm wide. Basidia 14-38 x 8-9 µm, 4-spored, surrounded by 3-5(-6) pseudoparaphyses. 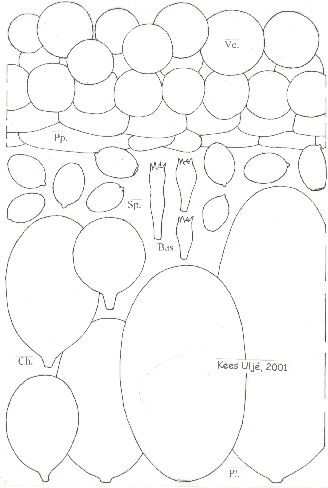 Pleurocystidia 50-150 x 30-80 µm, ellipsoid, ovoid or subcylindric. Cheilocystidia 40-130 x 25-70 µm, (sub)globose, ellipsoid or ovoid. Caulocystidia absent. Veil made up of subglobose cells, 15-40 µm in diam., thin-walled, connected by narrowly, somewhat diverticulate hyphae. Pileipellis a epithelioid hymeniderm. Clamp-connections not found, only pseudoclamps. Fasciculate or gregarious around truncs or on dead trees. Rather rare but wide-spread in Europe. 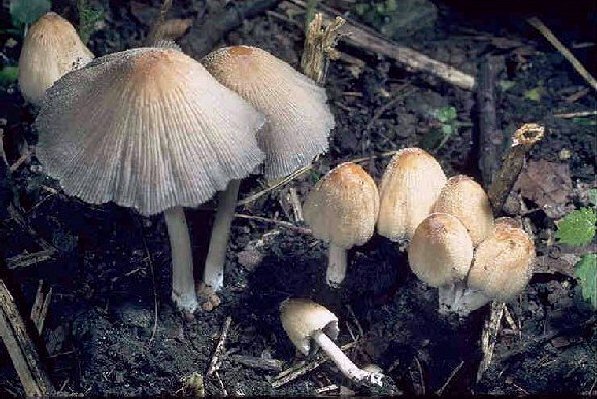 Coprinus truncorum is very close to C. saccharinus. Both of the species lack caulocystidia, but C. truncorum has pale ochre basidiocarps with very minute, soon disappearing, somewhat coloured, granular veil and the spores are only ovoid or ellipsoid, never in part somewhat mitriform like in C. saccharinus, which species should has the veil not coloured but pure white. The spores in C. truncorum in our opinion are narrower in frontal view (4.7-5.7 mm in C. truncorum, 5.2-6.7 mm in C. saccharinus). Further study is needed to find out if C. truncorum and C. saccharinus are different species indeed.